Like every nail art blogger (I think), I'm trying to get through a pretty big pile of unused polishes! I thought this polish, Nails Inc Kensington High Street, was a gorgeous rich color for fall. *note: the name of the polish wasn't written on the bottle, but I'm 99% sure it's Kensington High Street based on some online searches! I love the color, but I did have some trouble with the polish staining my cuticles (every single red-toned polish seems to do that!). It also took FOREVER to dry and I had to do four coats to completely cover my nail line. However, this polish stayed on my nails with minimal chipping for two weeks! On my thumb I added Zoya Maria Luisa. Isn't it gorgeous? Now time to go back to finding implicit derivates!! Thanks for reading & bearing with me through my erratic posting schedule! I hate it when dark polishes stain my cuticles, I always try work slowly with them and still manage to stain them lol. 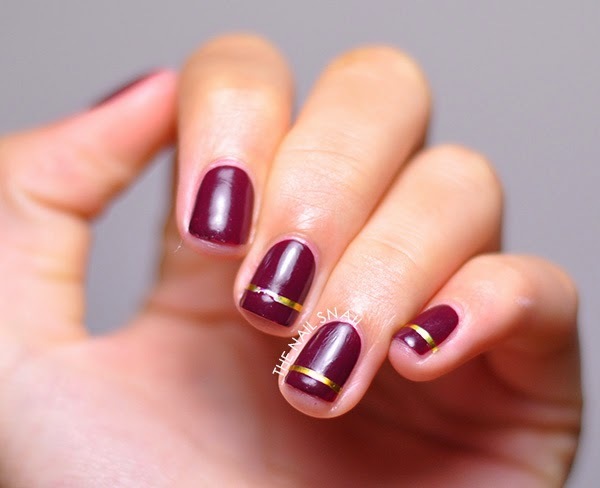 This colour is gorgeous adore the gold stripe you put on it. Same!! Somehow, it always happens :\ Thank you! Very pretty color and it looks fantastic on your nails! I have a lot of unused polishes and the problem is that I always buy new ones :) I can help myself, I am definitely addicted! Thank you! Haha, same -- I somehow always manage to justify it to myself! Your nails look so simple and chic, I love it! And the shape of that bottle is awesome. I guess for some people just one coat would be OK, but I'm kind of obsessed with covering up any VNL haha :) The problem was that when I built up coats past one coat it didn't really become any more opaque, so I ended up having to do 4 coats to cover up the VNL! I think it probably does have something to do with the "gel effect" thing because I haven't had this problem with any of their creme polishes. Thanks for reading! YAY implicit derivates! (no idea what they are) This colour looks really nice! Too bad about the drying time, but then again if it stays on for two weeks that's a big plus! When I want to wear a polish for a long time, I always have to pick an crelly polish with glitter in because you just can't get rid of those ;) It's nice to have a long lasting creme! Hahaha, you should probably be glad you have no idea :) Calculus is a struggle! I'd love to hear what you're thinking! I'm Lucy // 17 // U.S.
You can also find me on Nailpolis! All content © 2013-2016 Lucy Wu. Design by Lucy Wu. Powered by Blogger.